This article is about Chicago skyline #258Z is a pen & ink drawing of Chicago is a cityscape done at early sunset, which is a cityscape stylus sketch, which is for sale here, at discount with prints by artist Stephen F. Condren, SAIC, of Condren Galleries, a Fine Arts Gallery, offering JPEG & PDF scans. The view or perspective it taking from the northwest near Western Avenue. The three tallest points in the skyline are those of the near north side, east Randolph Street, and the Chicago Loop. At the near north side you have 875 N. Michigan Avenue (former John Hancock Center). In the center cluster you have the skyscrapers of the Aon Center and Trump Tower. The last cluster is on the right which shows Willis Tower. 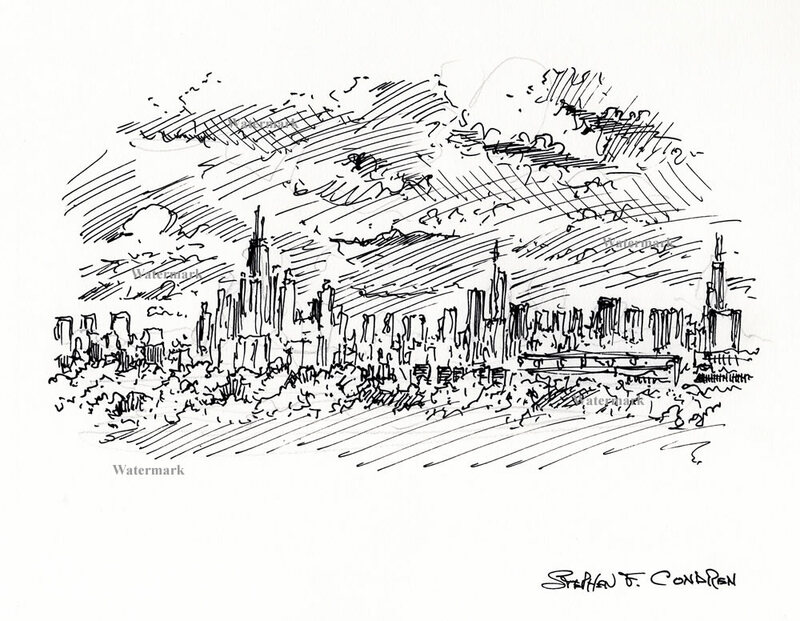 Chicago skyline #752B pen & ink drawing of downtown at sunset.